This was Canberra’s gift to itself for the Centenary celebrations. Personally I think another big party on the Lake would have been better received. 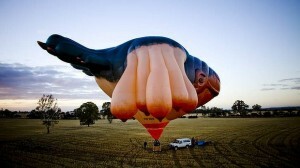 However it was commissioned to a former Canberra artist Patricia Piccinini by the ACT Government to design the balloon for Canberra’s 100th birthday. With a $300K price tag something more conventional might have sufficed, like a huge candle on top of Parliament house. However judge for yourself on its artistic merit.